Before heading to WWE/NXT on a full-time basis, Johnny Gargano began his final weekend in EVOLVE on Saturday night with his final singles match in the company. With genuine likability and charisma, Gargano has become the face of EVOLVE and one of the best babyfaces in the world. And even with an excellent roster full of talented performers, it will be almost impossible for someone to singularly replace what Gargano has meant to the promotion. In the main event of EVOLVE 68, Gargano faced off against someone who will attempt to become the new ace of the company in Zack Sabre Jr. The two had a very good match, though there were spots where it didn’t quite work and their matches earlier in the year at EVOLVE 56 and in AAW were better. With Joey Styles on commentary, the two did a lot of grappling as Sabre worked over the knee that Gargano has been selling as injured since teaming with Tommaso Ciampa against The Revival at NXT TakeOver: Brooklyn II. Gargano was eventually forced to tap out after Sabre applied a unique submission that pressured Gargano’s leg and arm while stomping on his head. Sabre cut a promo after the match, saying that he was going to carry the torch after Gargano leaves. Sabre vowed to beat Timothy Thatcher for the EVOLVE Championship. Ricochet then joined Sabre and Gargano in the ring. He put Gargano over and said that he would be missed, but noted that there is so much talent in the EVOLVE locker room that they'll get by without him. After Ricochet hyped his match with Sabre at EVOLVE 69 on Sunday night, the three men hugged to close the show. In what was comfortably the best match of the night, Ricochet appeared earlier in a three-way match against Matthew Riddle and Tony Nese. Riddle hit a jumping tombstone and locked in the Bromission on Ricochet, but Nese came off the top rope for a 450 on Riddle for the pin. All three guys looked great in the match, and Nese especially feels like a different performer after competing in the Cruiserweight Classic. Nese likely had as much to gain as anyone else in the tournament, whether it got him signed to WWE or increased his profile on the indies. He's felt like a bigger deal since competing in WWE, and he’s gotten a chance to face better quality opponents in singles matches than he usually would. Nese's athleticism has always made him feel like someone with almost limitless potential in the ring, and I hope he gets a chance to stay on the indies and further develop into a complete performer. Riddle and Ricochet were as great as they usually are, and EVOLVE would be smart to book a singles match between the two of them. Gargano also came out before this match started and put over all three participants as candidates to take his spot. After the match, Drew Galloway attempted to recruit Riddle to his crusade against EVOLVE. He said that wherever Riddle has gone, whether it be in the UFC or EVOLVE, he’s faced injustice. There has been considerable tension between Riddle and his Catch Point stablemates, and Galloway said that Riddle needs people to watch out for him. Galloway called Riddle the uncrowned EVOLVE Champion. That led to Drew Gulak coming out and starting the next match, but not before sharing an extended glance with Riddle. Galloway defeated Gulak in a good hard-hitting match after hitting a tombstone and holding on into a transition to a Future Shock DDT. Gulak kept applying submissions on Galloway, including a dragon sleeper in the ropes, but Galloway was always able to use his large frame to force the break. In addition to Gargano leaving EVOLVE, this is also TJ Perkins' last weekend with the company. And before facing Riddle on Sunday, he defeated Darby Allin with a kneebar in a solid match at EVOLVE 68. Allin impressed in the match with his athleticism and willingness to do pretty much any high-risk move. And with spots on the card being vacated by wrestlers headed to WWE, it would be nice to see Allin given a chance to further shine in EVOLVE. It was expected that TJP would get a good reaction given that it’s his last weekend in EVOLVE, but the CWC has seemed to make him more popular with the crowd than even I expected. Joey Styles got involved earlier in the show after assuming his new role as an authority figure in the company. Galloway interfered on behalf of his tag partner DUSTIN, hitting “Hot Sauce” Tracy Williams with a chair for a quick DQ. Styles restarted the match under extreme rules and barred Galloway and Williams’ Catch Point friends from ringside. In a brawl that included chairs, ladders, and thumbtacks, Williams picked up the win over DUSTIN with a sleeper. Also on the card, Ethan Page defeated Dan Barry with a package piledriver in a largely comedic match. There was a spot early in the match based on Barry’s appearances as a trainer on the WWE Network’s Holy Foley series where Page tried to get Barry to teach him how to wrestle, but Page eventually took control of the match. And in a good opener, Fred Yehi continued to look impressive as he defeated Jigsaw with the Koji Clutch. Yehi has really broken out this year. He's one of the talents on the indies that I always look forward to watching. The matches at EVOLVE 68 didn't reach the highs that last month’s SummerSlam weekend shows did, but the cards were better laid out and the shows felt better off for it. Everything on the show was worth watching, though the three-way match is the only thing that I would recommend going out of your way to see. 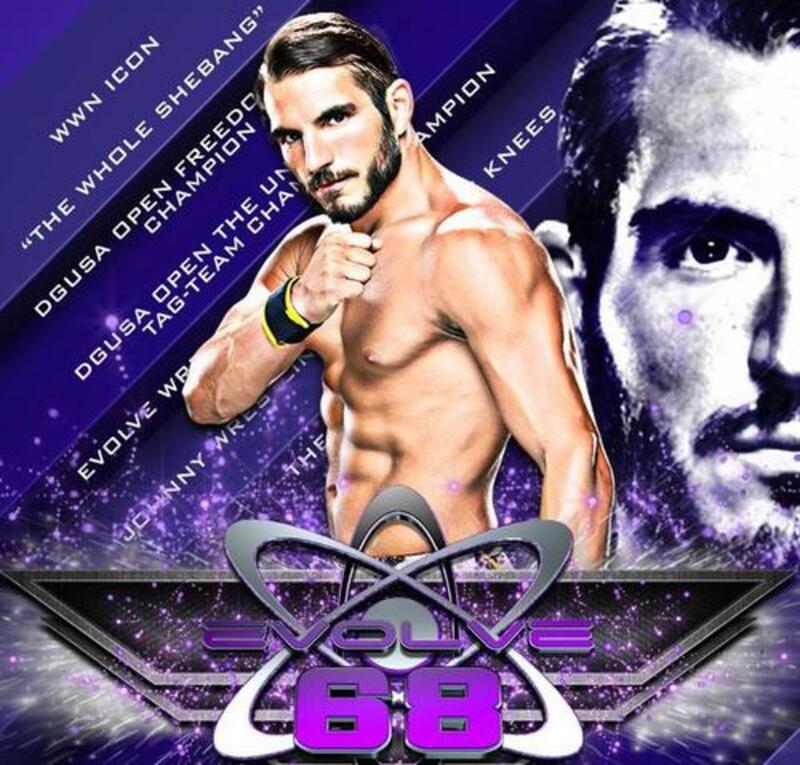 On what is sure to be an emotional show, Gargano bids farewell to EVOLVE on Sunday night at EVOLVE 69. Gargano will team with Cody Rhodes against Galloway and Chris Hero. And Ricochet will face off against Sabre. The show kicks off at 6:30 p.m. ET.